Camp Street Prison inmate Steve Richard Bacchus has testified that police officers and prison wardens made attempts to open the doors that blocked inmates from coming out of Capital A, but once that door opened law enforcement refused to enter. 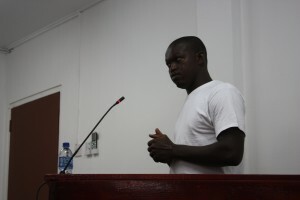 Bacchus was at the time giving testimony at the Commission of Inquiry (CoI) into the Camp Street Prison riot which claimed the lives of 17 inmates. The CoI heard that on the fateful day, an order was shouted for the prison door to be closed and shortly after the smoke was seen billowing from the prison dorm. “When I went there I heard somebody say close the door and y’all (wardens) come out…after the officers them come down stairs I saw dark smoke coming out he building and I heard prisoners saying y’all open the door open the door help we help we,” said Bacchus. The man recounted that after shouting for the officers to help and getting no response, prisoners took rescue attempts into their own hands and mounted a rescue. The inmates who has been convicted of robbery, told the Commissioners that he recalled seeing officers made attempts to open to doors to Capital A, but for some reason, those attempts were initially unsuccessful. It was noted that the officer spent less than two minutes trying to open the door before he retreated to the safety of the prison yard. 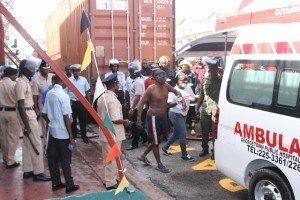 The inmate testified that it was only after the door was soaked with water that the prisoners were able to open it with the aid of prison wardens. After the doors were opened, prisoners rushed in but had to retreat to wet their skin because of the heat in the building. “When the door open me along with three other prisoners run in the building and run out back cause the heat was too much…The officers was downstairs, they were assisting downstairs,” said the inmate.